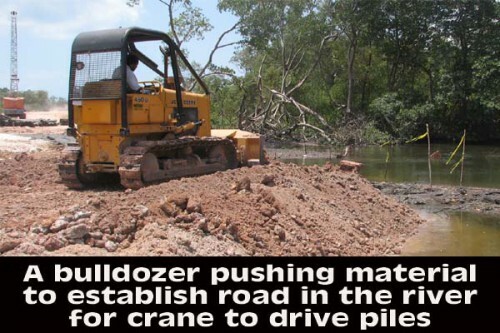 A third bridge that is intended to join the northside and southside areas of Belize City, over the Belize River, has caused much controversy in the past few weeks – first by a group of squatters on the Lake Independence side who are saying that their area representative, Hon. Mark King, reneged on his promises after assuring them that the new project would not spill over onto the properties that they now occupy; and now from residents on the other side in Belama, who have expressed their concerns about harmful environmental impacts that have resulted from the plan to construct a bridge adjoining the two sides of the city. As residents who have squatted in the low-lying extended areas of Holy Emmanuel Street in the Lake Independence area remain under a cloud of uncertainty as to where they will go next, since they have been told that the project will claim the meager tracts of government land that they have inhabited, some Belama residents have also detected disruptions in their way of life and in the environment in which they live which are already causing serious concerns. While fears about increased thefts as a result of the crossover of residents from the St. Martin De Porres area in Lake I – who go over to the other side to steal from unwary citizens in the Belama area – might be a concern, there have been other issues raised that seem to be as troubling to Belama residents..
Today, Amandala spoke to one of those residents, who told us that they have no problem with the project itself, but said that the way in which the contractors apparently intend to construct the bridge is causing all kinds of havoc in their community. The person said that she lives in the immediate area adjacent to a nearby canal that empties into the river, and they noticed that since workers have started to fill the river with sand, blockading the greater part of the river, the canal has been stagnated, which has led not only to the death of many fish, but has also caused a serious stench in the residential area. The resident even told us about a manatee that was in the river, which apparently got lost and went into the canal, and was unable to cross back into the river. Apart from the effects on the animals and wildlife, the resident stated that no one from the area was consulted prior to the project’s commencement to see how they felt about the development, especially since the heavy machinery being used is currently causing noise pollution in the area, and what’s more, they don’t know if any Environmental Impact Assessment (EIA) was done to see what damage would occur as a result of the project. According to the person with whom we spoke, she has been disconcerted by the fact that her husband, who is a fisherman who normally goes upriver for sticks to build lobster shades, has not been able to access the river and therefore has to go further and use additional gasoline to get the sticks that he needs to do his work. She mentioned that they have two children and that it has taken a toll on their livelihood because her husband is the breadwinner of the family and now he has to use additional money to pay for gas to be able to find the sticks he needs. “All we would want is for them [the authorities] to open back the channel so that boats can pass because it is causing a health hazard, and we believe that some kind of EIA should have been done with respect to this project”, the concerned area resident said. A worker who was at the site when we visited told us that the river has to be filled so that a crane can drive the piles for the bridge’s foundation, after which all the sand that is currently in the river will be removed so that the river can flow smoothly. Amandala attempted to get in contact with Edgar Puga from the Ministry of Works, who, we understand, is the person responsible for the project, but we were informed that he will not be available until tomorrow. We also tried to speak with Wendell Parham, the Chief Executive Officer in the Ministry of Forestry, Fisheries and Sustainable Development, to check whether an EIA was actually done for the project, but we were told that he was in a meeting and will not be in office for the rest of the day. The squatters, on the other hand, had been asking their area representative, Hon. Mark King, to compensate them with another piece of land somewhere else, since some of them have made serious investments in their homes, which appear to be just ramshackle huts to outsiders. King was unresponsive to questions from the media for the first few days after the story broke, but he remarked on the issue on his social media page this Monday, April 7. As one would imagine, the affected residents did not take those remarks sitting down, and one of the squatters fired back at King, recommending that he should remember the promises he made to them when he asked for their votes in the last elections. Although King would not honor their requests for another piece of land, he mentioned that there is an offer on the table where the squatters can be assisted in moving their houses.